A couple of months back, Rick Cendejas posted a vintage photo of himself on Facebook. In the photo he is cleaning his Line SI Bushmaster. You can see his Ironmen squad patch and you can also see a custom made perpendicular arm attached to his Line SI Bushmaster pump handle. Rick Cendejas working on his Line SI Bushmaster. Ironmen Squad patch for “The Bad” pictured on his right arm. Photo circa pre 1990? Photo courtesy Rick Cendejas. I recognized this pump arm immediately since it was the identical pump handle that came with a Bushmaster I purchased close to ten years ago. The Bushmaster has Rick’s last name, “Cendejas” cut into the pump arms, hopper and receiver rail. “Ironmen” is also scratched into the plastic of the included VL-90. Left side of Rick Cendejas’ Line SI Bushmaster. Body has been changed but pump handle is the same as pictured. Rick went on to post several more photos so I got in touch with him on September 14th, 2014, to ask him about his history on the Ironmen. Playing with the Ironmen regularly from 1987 until around 1994, Rick saw many members of the Ironmen come and go and the team transformed from a competitive Northern California team to an international championship winner. 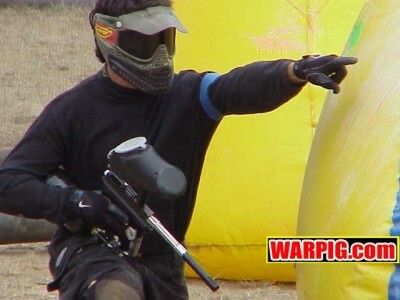 Rick played all over the country with the Ironmen and shot a variety of different paintguns, even when the main group was gravitating to the WGP Autococker. 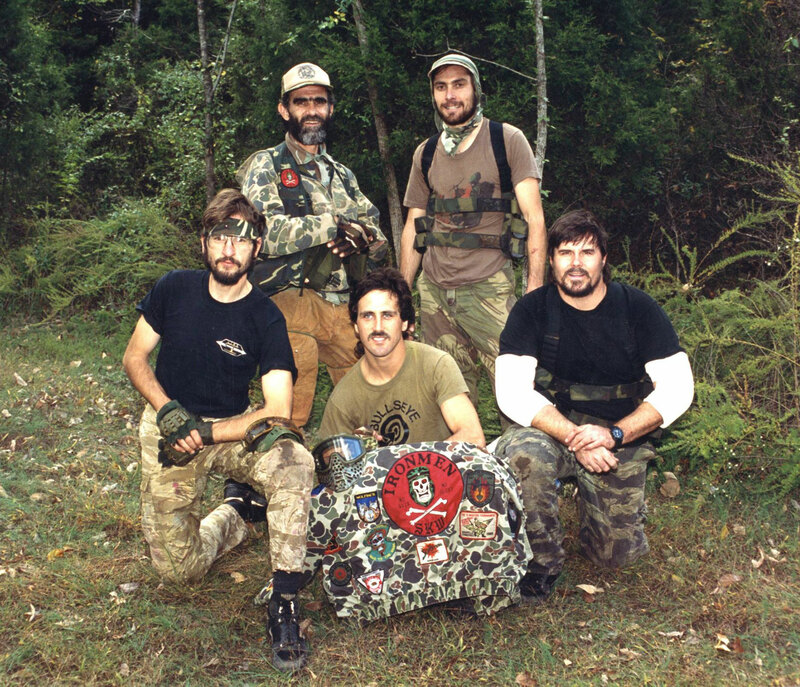 Cendejas got his start in Paintball around 1986 or 87 playing at Action Paintball Games (APG) in Ione, California (outside Sacramento) . Dennis Wolfe, a fellow machinist, had been bugging Rick to play and he finally gave in. Starting out like so many others during the mid 1980s, Rick’s first pump was a bolt action Nelspot 007. 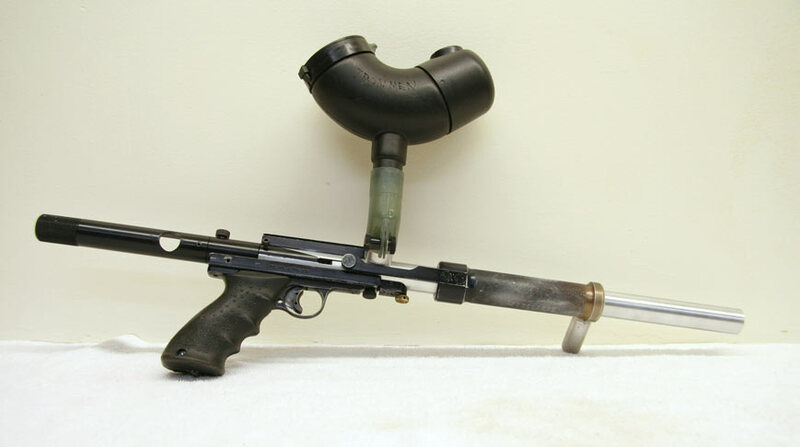 Shortly after starting to play paintball and traveling to courses around the Bay Area, he saw other shooters using PVC pump handles and decided to fashioned his own. A machinist by trade, he fabricated many small modifications and additional accessories over the years. After they had played together, Wolfe asked Cendejas to join his team, The Mutant Ninja Turtles. Rick went on to play briefly with the the Mutant Ninja Turtles, and soon after decided to ask his friend and fellow bow hunter, Bob Long to come out and try paintball. Rick writes that at the time “Bob Long was a well known well-known archer” who ran an archery and taxidermist shop. “Delta Archery was just a couple of miles from where I used to work at the Concord Naval Weapons Station and I spent many hours there honing my target skills and got to know Bob. I knew he would like the game of paintball, but like me, it took several invitations before he finally tried it,” says Rick. After Bob was introduced, he and Rick started their own team, Delta, named after Bob’s Archery shop. Mount Diablo Venture Games Patch. From the collection of Joel Kaufman. 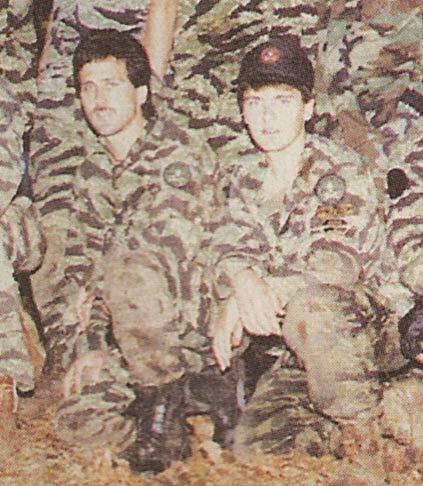 During the next few months of 1987, Cendejas and Long played as Delta. 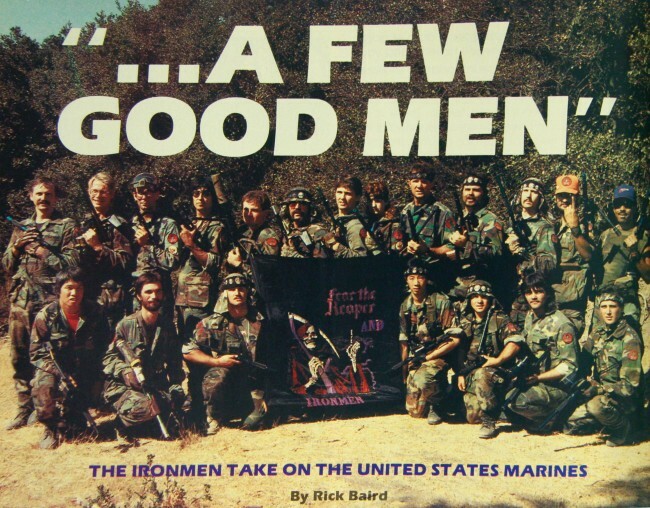 “We were playing as Delta and we thought we were pretty tough,” says Rick, but when they first encountered “General Rick” Baird’s Ironmen at Michael Leon’s Venture Games Paintball Field on Mt. Diablo they were blown away. Rick “General Rick” Baird’s Ironmen c. late 1988-1989. 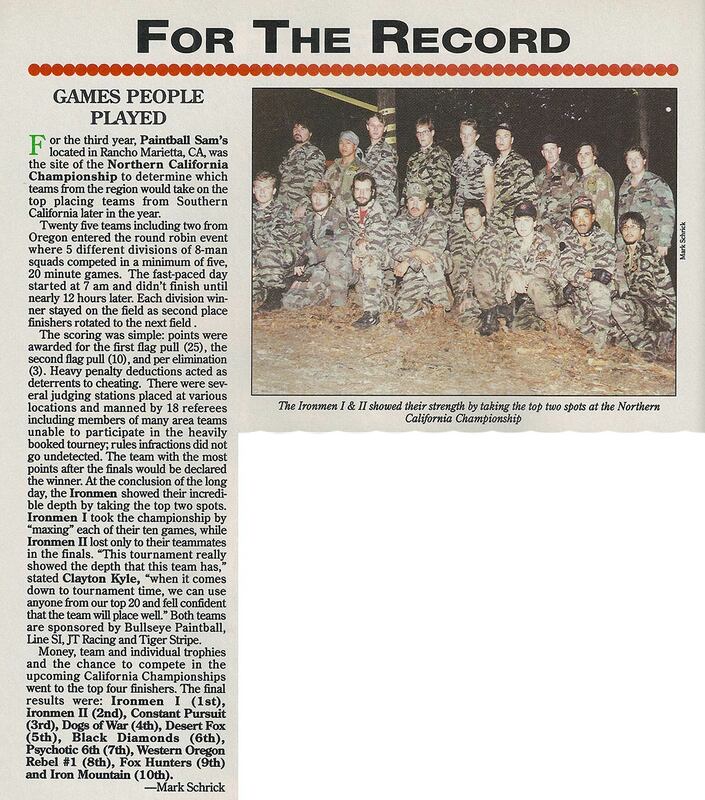 Photo scan (or reshot) from Paintball Sports Magazine August 1989. Rick Cendejas picture lower right. When first matched against the Ironmen, Delta were faced with a wall of paint that couldn’t be penetrated. Cendejas played with the Mutant Ninja Turtles and Delta during the same period. Shortly after starting Delta (as a team) both Rick and Bob joined the Ironmen. The original Ironmen captain, Rick Baird was a welder and some of his teammates who made up his original team were also Ironworkers, which is where they derived the team’s name. Right side of Rick Cendejas’ Line SI Bushmaster. “Ironmen” is just barely visible cut into his vl-90 loader. 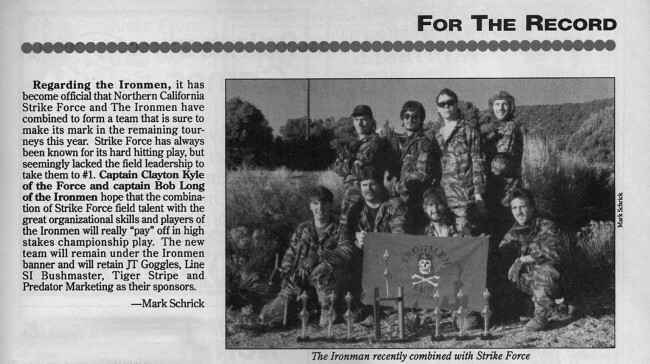 Line SI and the Ironmen c. 1989-1990? From a Nelspot 007 with a pump, Rick moved to a few different Bushmaster’s over the next few years (1987-1989) as the Ironmen were sponsored by Line SI up until around 1990. 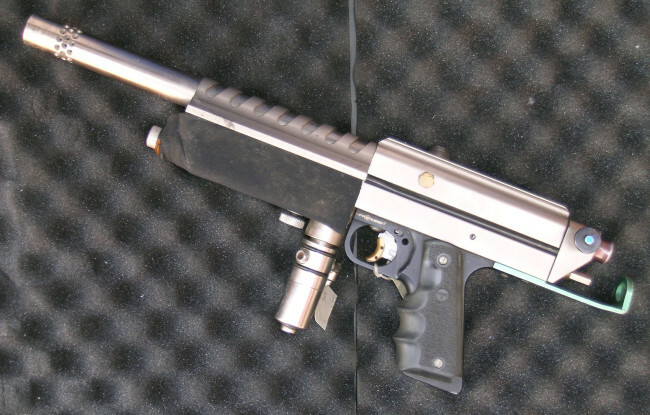 Modifications that Rick did to the pictured Bushmaster above include the perpendicular T pump handle and some brass internals. 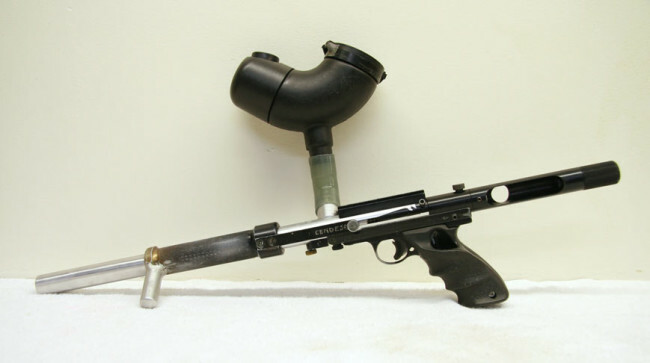 “To grab around and pump was too awkward [when on the ground] and that [modification to the pump arm] seemed to work out. We did a lot of crawling and shooting,” Rick explained. Ross Alexander (left) and Bob Long (Right) after Long has won a Top Gun shootout (not at Top Gun Paintball, NJ but a Top Gun Competition). 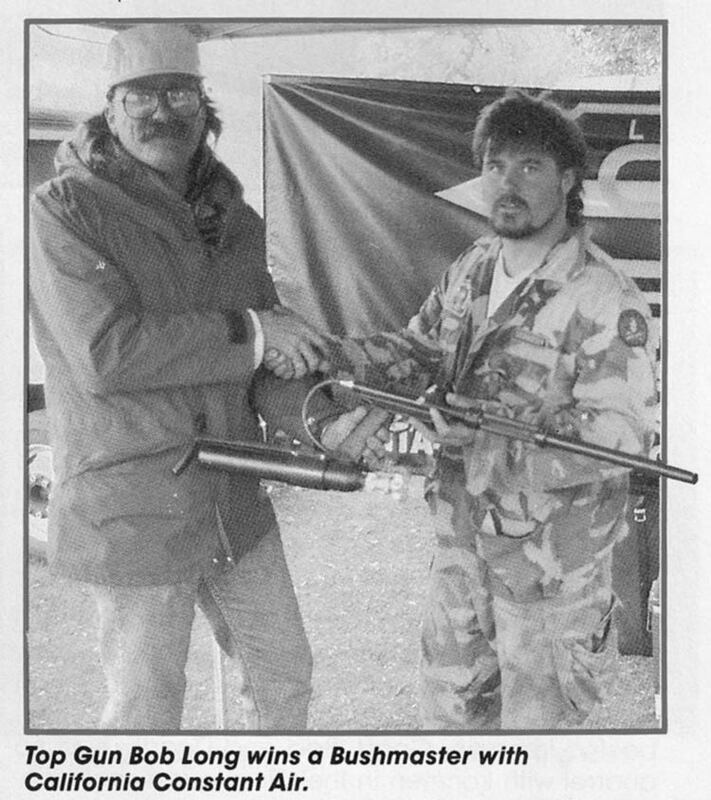 Scanned from Paintball Sports Magazine May 1990 issue. In 1988-89 the Ironmen competed in their first national competitions including the National Survival Games Championship and the Air Pistol Open. At the 1988 Air Pistol Open some of “General Rick” Baird’s choices as captain led him to step down with Bob Long taking over the team. “We wanted to go in a more serious directions [and Rick Baird] pretty much gave [the Ironmen] to Bob Long,” remembers Rick Cendejas. 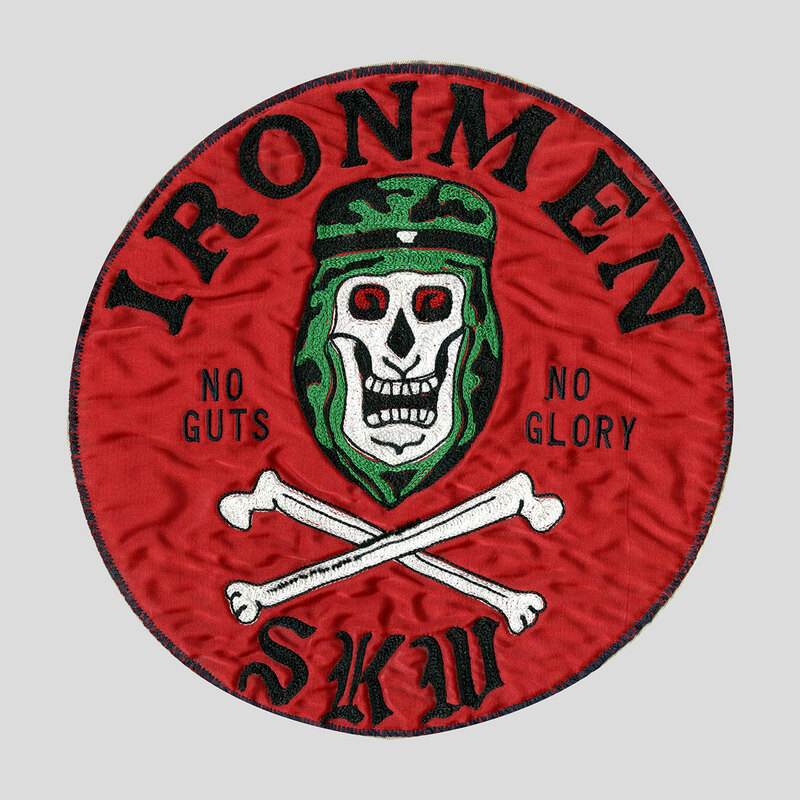 Ironmen Frisbee size jacket patch from Scott Rich. 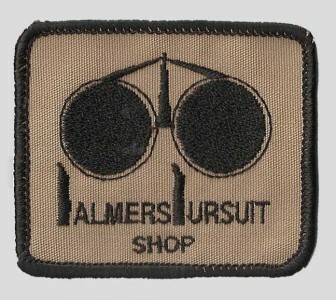 Patch c. 1988-89? SKW stands for Stalk – Kill – Win. Rick Cendejas with teammate and playing partner Michael Baird. Scanned from the January 1991 issue of Paintcheck Magazine. After stepping down from the captain position, Rick Baird occasionally played, and his son, Michael “Machine Gun Mike” Baird remained on the team. Rick Cendejas ended up becoming good friends with Mike and remembers that they would typically be playing partners, close behind one another in games and tournaments. Ironmen Merge with Strike Force. Scanned from September 1990 Paintcheck. In 1989, as the Ironmen played under Bob Long, the powerhouse team of the early 90s started to form. In 1989-1990 the Ironmen merged with Northern California Strike Force, which added Clayton Kyle and Marty Bush to the roster. Rick thinks part of the Ironmens’ advantage early on was their lack of a home field. Until around 1990, when Carpet Bob joined the team, the Ironmen were forced to constantly adapt to various fields and didn’t rely on a home field advantage. In July of 1990 the Dogs of War premiered a full squad of players shooting semi automatic Palmer’s Pursuit Shop Hurricanes at the Lively Series Bay City Open. 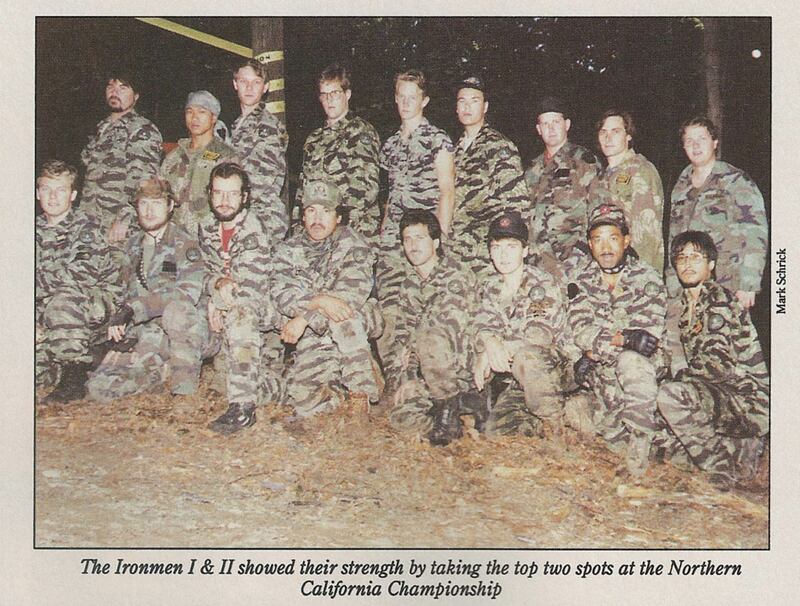 The Ironmen after winning the Line SI Masters 1990 5 man championship. C. October 1990. Back row left to right, Carpet Bob, Marty Bush. Front right left to right, Chip Hyde, Rick Cendejas, Bob Long. Players for the Ironmen at this event included Rick Cendejas, Bob Long, Marty Bush, Chip Hyde and Carpet Bob. 3 of their 5 players wielded Palmer’s Hurricanes. Rick believes Bob and Carpet Bob, and himself were shooting Hurricanes. Ironmen I and II team photo c. September to November 1990. Scanned from the January 1991 issue of Paintcheck Magazine. Find this complete article scan at here. 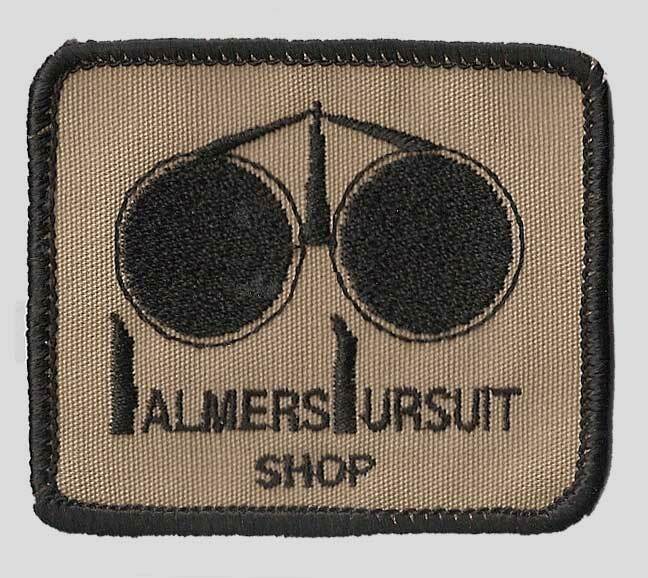 “My favorite memory with the Palmer’s Hurricane was at Paint Ball Sam’s near Sacramento. We were practicing for a tournament to be held there the next week and it was the end of a long day’s practice with other teams who would be there. We were to play the Nevada Dust Devils and two of them didn’t want to play so I volunteered to play on their side to make it even. Knowing that the Ironmen would be playing heavy left on the field and defending the middle and right side, I made a mad plan to blow right down the middle-right fully expecting to be shot out, but hoping those going with me would succeed towards the flag. We blew through within one minute and I remember shooting a couple of guys while doing a full sprint while holding that full-wood-stock Hurricane rifle with one hand. Rick told me that he used his Hurricane until the Ironmen received their sponsorship in 1991 from Worr Game Products and ended up all getting Autocockers. Cendejas “wanted to like” his early Autococker but after trying to grow accustomed to it he ended up moving to the Fastech F1 Illustrator when it was released. Ironmen circa 1991? Photo courtesy Rick Cendejas. Rick Cendejas’ Satin Nickle Ironmen Autococker from 1994. Photos courtesy Dale Price. Bob’s wife, Phyllis Long would keep stats on the team. More than a year after introducing the Autococker, Rick remembers Phyllis’ stats on guns related issues. This was likely before the introduction of the Rock Regulator, prior to Summer 1992. Rick says, “during the first year, we had 2.2 guns down per game.” At the time the Ironmen consisted of 9 Autocockers and Rick with his F1 Illustrator. This would have been before the introduction of the Palmer’s Rock Regulator and the first stock brass regulators lead to a lot of early problems. These stats would help Phyllis and Bob notice and improve the team and help players think about their decisions. For Rick it was never a win at all cost game and at one point he remembers Bob bringing up stats on his being shot out around 5 minutes on average, which Bob commented was early in the game. Rick says “I would ask him, how long did the games last,” and Bob would sort of chuckle and walk off since the average game time was about 7 minutes. And in most cases Rick’s pushes were required for the team to gain ground. As a front player, Rick remembers not wanting to let the games come to a draw. He explained that during this time he was treated like the “Red headed step child” of the Ironmen, he played for the team but didn’t really follow the same norms as the rest of the guys. Rick still occasionally played with Autocockers and must have used them more frequently as time went on. Right side photo of Rick Cendejas’ Satin Nickle Ironmen Autococker. Photos courtesy Dale Price. Pictured above is Rick Cendejas’ Nickel Plated 1994 Ironmen Autococker, which resides in the collection of Dale “Sugarstump” Price. NPPL Dallas 1994, Ironmen are pictured with nickel Autocockers. Cendejas not pictured. 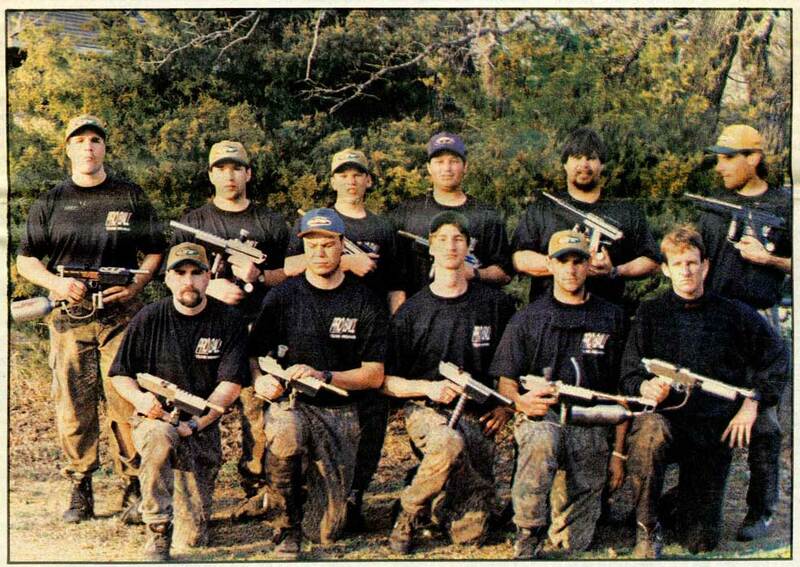 Scanned from Paintball News April 2nd 1994. The Ironmen were first pictured with these Autocockers in the April 4, 1994 Issue of Paintball News after winning the Dallas NPPL event. 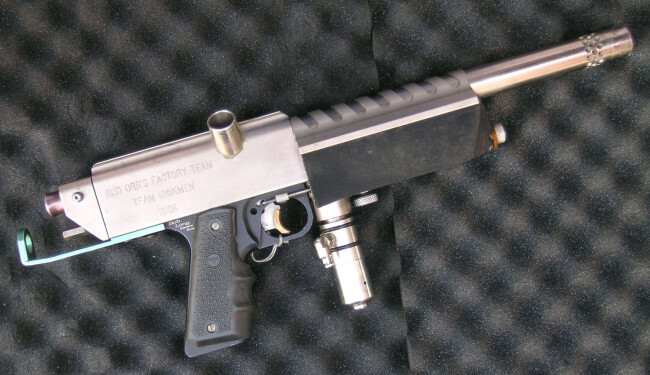 These Autocockers would, in my opinion, become the most publicized run of specific team paintguns during the mid 90s (I would say even more so than Predator Autocockers). During this period the Ironmen were winning a string of major events for several years straight playing with these cockers, from 1994-1996. Left side of Cendejas’ 94 Ironmen Autococker. Photos courtesy Dale Price. 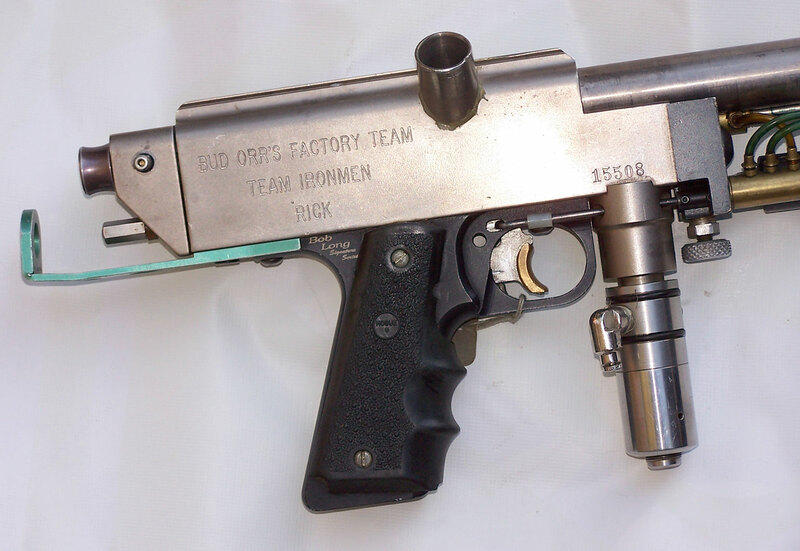 Although they were already shooting Autocockers all the way back to March 1991, most players began using these nickel played cockers from April 1994 onward as their main marker. I’ve posted photos of the ’94 Nickel Autocockers that were engraved for Clayton Kyle, Dave “Youngblood” Dehaan, Brahim Estephan and was excited to receive these photos from Dale Price. Serial numbers for the Ironmen’s 94 nickel autocockers seem to be mostly around 16K but from Dale’s photo, Cendejas’ serial was likely built off an earlier body. Brahim Estephan’s is 27090 (engraving is wider). Rick remained on the Ironmen until the 1994 season, at that point he felt himself distanced from the core of the Ironmen and found himself sitting more games. As more unprofessional or immature incidents started to occur with team members, Rick decided to step away from the team. For the 1995 and 1996 season, Rick Cendejas and Mike Baird commuted to practice and play with the Good the Bad and the Deadly (GBD), based out of Southern California. On GBD, he competed against the his former team at the 1996 Las Vegas NPPL event. The above video, uploaded by Dale Price, shows the 1996 Las Vegas NPPL event with Rick playing for GBD against the Ironmen. Rick, whose last name is misspelled in the video as Zendehaus, can be seen throughout the video shooting what looks like the same Nickel played Ironmen autococker pictured above, from Dale’s collection. In the video, Rick holds GBD’s right side 50, constantly putting tension on his former teams flank. He pulls ahead and then at about 8:30 he has to pull back one bunker, is targeted by Youngblood and then is bunkered by Bryon Benini but in the process, the Ironmen lost players and were distracted causing them to loose the opposite side of the field, being over run by GBD who go on to win the match. Rick remembers, “In the GBD [vs the Ironmen] game I had that pivital spot in the middle [of the field] and the Ironmen had to push. I never saw it coming the way [that Benini] came over the top of me but I knew that if they came to take me out [and I did get bunkered] my GBD guys would have my back.” Rick points out, that push, forced the Ironmen to loose critical players and was a major factor in the Ironmen loosing the match. Right side of Cendejas’ 94 Ironmen autococker with shroud on. Photos courtesy Dale Price. 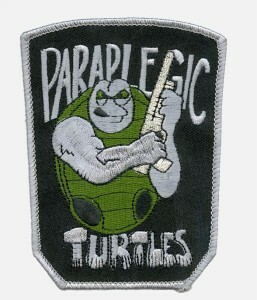 Rick also played a couple season with the Paraplegic Turtles. 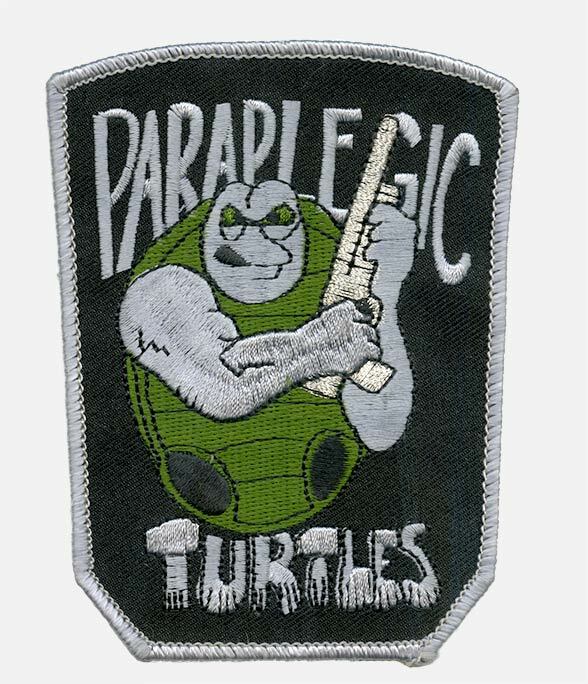 Paraplegic Turtles at the 1999 Las Vegas NPPL. Photo courtesy Rick Cendejas. 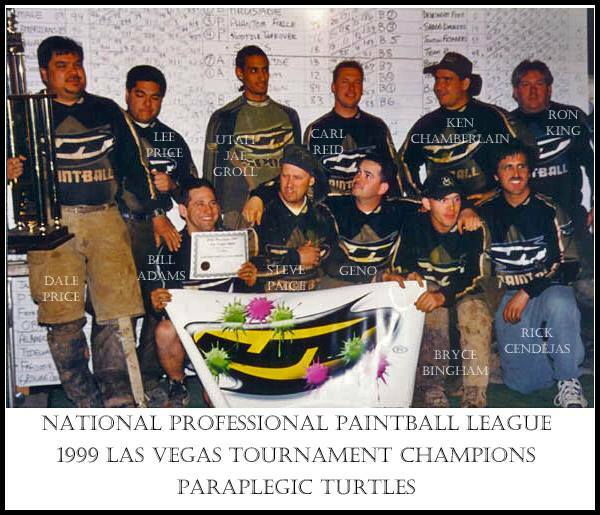 Above is a photo of the Paraplegic Turtles at the 1996 Las Vegas NPPL event. Photo courtesy Rick Cendejas. In the late 90s, Rick also joined up with an amateur team, Sin Dicate, who competed in the Great Western Series and Pan Am tournaments up until the early 2000s. Rick Cendejas, playing on Sin Dicate at Seattle 2001 Pan Am event, shooting his Bob Long Defiant. Photo courtesy Bill and Dawn Mills. Find the photo on warpig. In the Great Western Series, run by Dan Bonebrake and Russell Maynard, teams could still compete in the amateurs competition with one professional player on the roster which, in the case of Sin Dicate, was Rick. 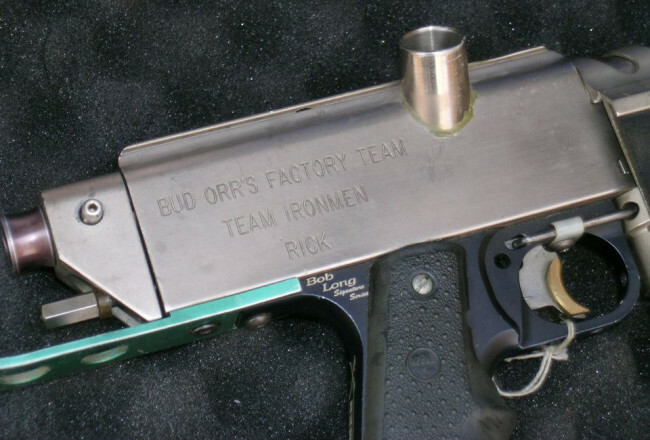 Thanks to Dale “Sugarstump” Price, for providing photos of Rick’s 94 Autococker and quotes. Thanks to Bill and Dawn Mills, of Warpig, for permission to use their media. A look and some details about a possible 32 Degrees' jersey that is marked for Bob Long's Ironmen. This dates to 2001 and was likely a practice jersey. I played with Rick on Sin-Dicate. Great guy, great player, and always willing to help out. Really superb teammate. Amazing to see all this history especially the video. I cant remember if I was in that game, but I think I might of been and heard my name on the audio but wow that was a long time ago..! Wow !!! Mike/Rick hope all is well ! Nice article. Fascinating article. Much thanks to all those involved contributing all the info. Cheers. Great walk down Memory Lane. I still consider “Buddy Rick” as a close friend even though we don’t talk often we lived a part of paintball history that I’ll alway remember. Thanks for the article.